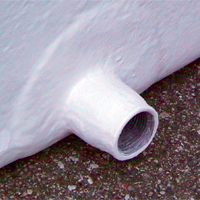 Fiberglass Tank 24" x 24" x 30" | U.S. 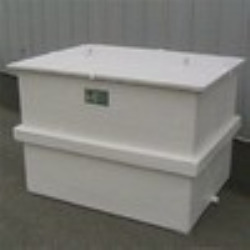 Plastic Corp.
HomeTanks & Accessories Square & Rectangular Open Top Tanks Fiberglass Tanks Fiberglass Tank 24" x 24" x 30"
Rectangular tanks are constructed with a premium grade vinyl ester resin corrosion barrier and can handle rough service in corrosive environments. Fiberglass tanks can be ordered complete with a full range of optional features and accessories to match your manufacturing requirements. When installed, tanks must have adequate bottom support. The standard tank features include a heavy duty construction with all corners double wrapped top flange for extra reinforcement exterior of tank is resistant to splashes and spills. Tanks may be used for standard metal plating solutions such as nickel, cadmium, silver, and gold. 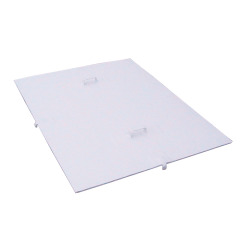 Tanks for use with chrome, tin, and zinc plating solutions must have a synthetic surfacing mat (Add 5% to tank price). As is typical with most resin systems, users may experience somewhat reduced equipment life, particularly at elevated temperatures. The sizes below indicate the ID - L x W x D. Non-returnable.